Marvel Studios isn't taking over Hall H at San Diego Comic-Con this year, but they have a pretty good presence at the annual convention anyway. Avengers: Infinity War was the darkest movie of the Marvel Cinematic Universe to be released so far, which led the studio to come up with a group "therapy" session for MCU fans who happen to be in San Diego for Comic-Con. The pop-up is called "Group Hug," and it's taking place over by Petco Park. Sad Infinity War fans are able to check out a deleted scene from the movie ahead of the Blu-ray release later this summer at the pop-up. The "Group Hug" therapy session allows MCU fans to mourn the loss of all of the heroes who turned to dust at the end of Infinity War. It's a comfortable, safe space for fans and it gives everybody a chance to deal with what they saw on the big screen. But, the best part of the whole experience is the deleted scene from the movie that takes place after Thanos kidnaps Gamora on Knowhere. 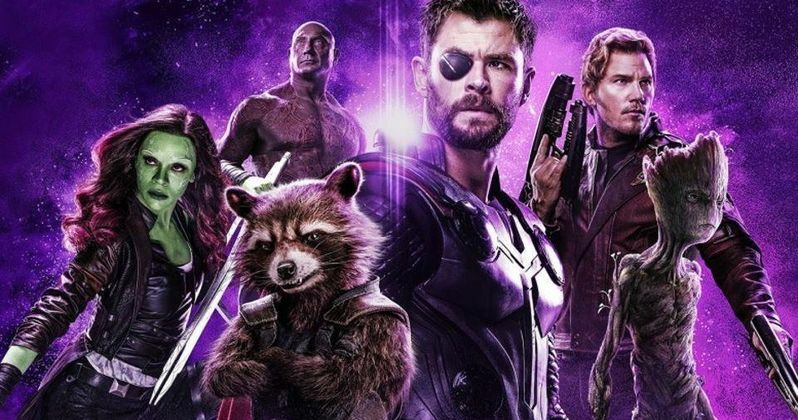 According to reports, the deleted scene is called "The Guardians Get Their Groove Back." The scene takes place back on the Milano as Drax rips the Zune MP3 player from the ship's sound system, complaining that Star-Lord is only listening to the same KISS song over and over, which is "New York Groove." The crew still hasven't left Knowhere where Mantis and Drax are now playing hot potato with the MP3 player, keeping it away from Star-Lord, who maintains that he needs the song to get his groove back. Star-Lord then blames Drax for putting Gamora in danger in the first place, which really gets him upset. Drax insists that it's Star-Lord's fault because he wouldn't let him seize the moment, yelling "you tried to kill her!" Star-Lord defends his actions, stating that Gamora told him that it would save the universe. While Drax and Star-Lord are arguing, Mantis notices a blinking yellow light, which turns out to be a message from Nebula alerting the crew to let them know that Gamora is still alive. Nebula gives them the coordinates to Titan, which is how the Guardians end up there. The Infinity War deleted scene is both humorous and heartbreaking at the same time, which fits just about all of the scenes with the Guardians of the Galaxy in them. It's nice of Marvel Studios to think of fans and allow them to grieve together and get through the pain of Infinity War together, while also promoting the Blu-ray release of the movie. Speaking of which, Infinity War will be available to purchase digitally on July 31st and then the Blu-ray package follows on August 14th, so if you weren't able to make it the "Group Hug" event, you don't have to wait much longer to see the deleted scene. This report originated from Slash Film.